Each of the talking sticks shown on this page is unique. There will be some variation from piece to piece. Iroquois Talking Sticks are approximately 2 feet long. 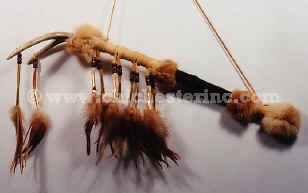 Materials include: deer antler, deerskin, feathers, glass beads, trade cloth, and rabbit fur. Each talking stick comes with a card shown below. For more Native Gifts, click HERE. The Talking Stick has been used by many different tribes in order to give the speaker the power to talk freely and to have an attentive audience. Whoever held the talking stick could talk without interruption and whatever was said by the person holding the talking stick could not be repeated outside of the circle. This talking stick was made with pride in the USA by Ramon Mitten, Seneca Band, Six Nations.